This is an original GE made 3JC6A Sharp-Cutoff Frame-Grid Pentode electronic vacuum tube. This collector's special electronic vacuum tube device is difficult and expensive to make. 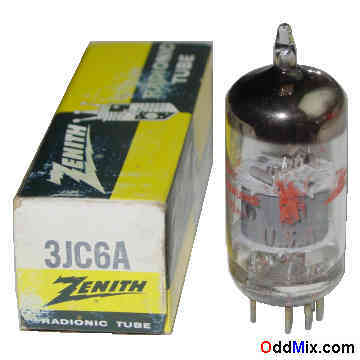 This nine pin, all glass, noval type used as a high gain RF or IF amplifier, usually in class-A configuration in many instruments, radio and television (TV) receivers. Excellent part for replacement, antique radio or television restoration, circuit design, experimentation or for rare tube collection. It is an NOS [New Old Stock] tube with box, unused.